A monthly festival of funk and soul with some of the strongest UK bands & DJs on the scene. 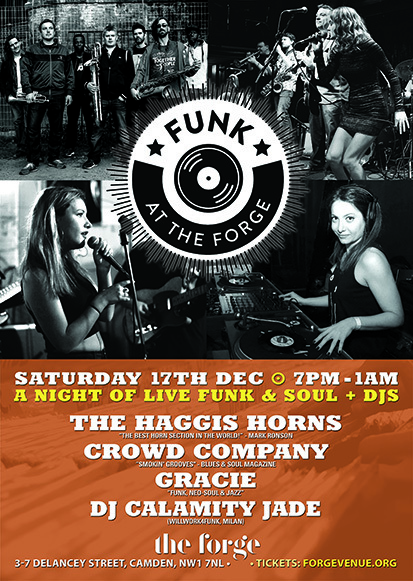 Co-Headlining this very popular monthly night are The Haggis Horns and Crowd Company, who also host. Flying in from Milan, DJ Calamity Jade (WillWork4Funk) will be spinning funk & soul 45s throughout the night. And, to open the night, more live music from the talented newcomers Gracie. TICKETS: £6 in advance. £8 on the door.